iOS 12 offers a host of great new features. From the amusement of Memoji, the immersion of ARKit 2, and the utility of Siri Shortcuts, there is plenty to love that was announced at WWDC 2018. The biggest improvement to iOS 12, however, is performance. Visit the iOS 12 Announcement Page and take note -- performance is at the top of the feature list. This is a signal to developers: evaluating your app for performance is a critical step to delivering an exceptional user experience. Now is the time to make room in your backlog for regular performance optimization. How often do we access the file system? How many files are we storing? Are we storing in the right place? When is our layout invalidated & redrawn? How complex is our view hierarchy? Are we only rendering what is necessary? Are we configuring UIKit thoughtfully? Are we re-using instances where possible? Are we reacting to memory warnings? Are we using all allocated resources? Are we performing duplicate operations? Are we receiving server responses efficiently? Are we parsing server responses efficiently? Are our animations out of the user's way? Are we displaying content as soon as we have it? Are we prioritizing our critical path? Most iOS performance optimizations involve moving expensive operations to background queues, removing duplicate & unnecessary computation, and ensuring that the SDK is being used correctly and thoughtfully. This is by no means a complete list. You'll always find performance challenges that are unique to your application. The techniques in this article will help you capture these bottlenecks quickly and take a data-driven approach to resolving them. As you read along, you can compare the before branch to the after branch to get a detailed look at what changes were applied. The app works fine, and it looks great. But we're getting some user reports that it is feeling a little slow, especially on older devices. 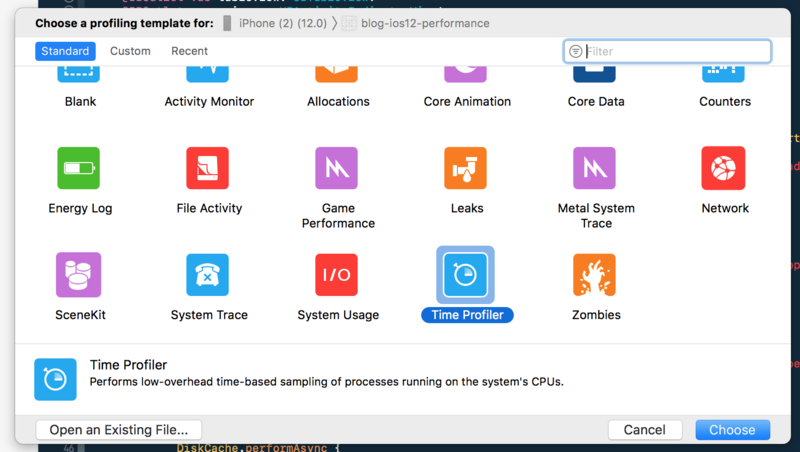 Let's dive in to how we can identify, resolve and prevent these types of performance issues using iOS 12 and Xcode 10! One of the problems our users are reporting is choppy scrolling. 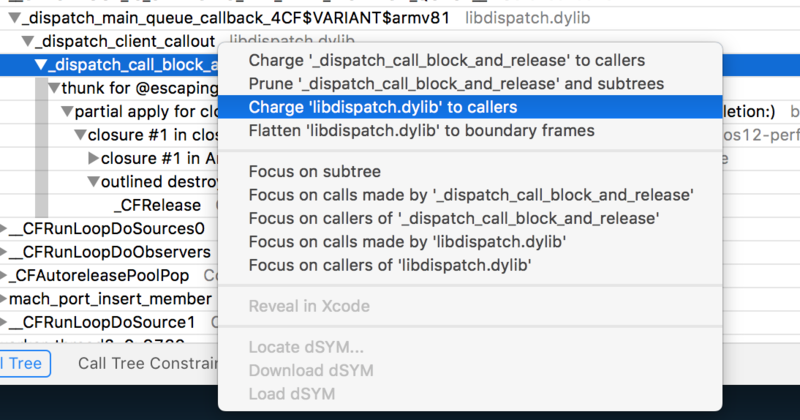 A common culprit for this problem is performing expensive actions while trying to load cells in a UITableView. None of this looks particularly harmful--we're just dequeuing a cell, and configuring it with a model object. But, we should probably take a closer look--it's likely that this method could be a problem spot for scrolling. 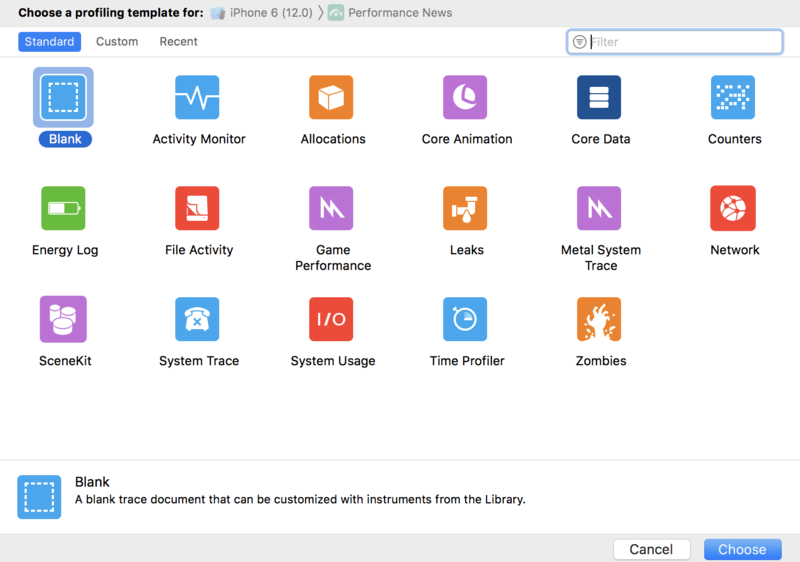 In Apple's WWDC 2018 session on Measuring Performance Using Logging, they detail and discuss the new os_signpost API available in iOS 12. Let's add some signposts to our code to help identify this problem. First, we need to add an import statement, and create an OSLog object. We'll define ours as a static parameter on a struct. We're creating a special UUID.ReferenceType so that we can tie these signposts to a particular call of the method. Using a OSSignpostID allows us to link a pair of begin/end signposts using an object. This is great for situations where we want to add signposts to an operation that could occur many times, with different metadata. Now that we have our signposts set up, we can open up Instruments, and use the os_signpost instrument to examine the results. Just double click, or drag and drop from the search results into the left pane. Now, let's hit record, do some sample scrolling, and examine the results! If we open up the "cellForRow" dropdown in the bottom area, we get a load of information. Most of this information is about the time between signposts. Now, as mentioned in the What's New In Cocoa Touch session at WWDC, we only have 16 milliseconds to get through cellForRow without causing dropped frames (and only 8 milliseconds on 120Hz iPads, like the iPad Pro). As we can see from the data, it looks like our average duration (6.8ms) is below the recommended time limit. However, we have several cells that are taking far longer than our 8 millisecond limit, with some taking more than 65ms! This means we are definitely dropping frames, and is likely the cause of our choppy scrolling. Remember one of our go-to-approaches for optimizing performance: take heavy-load operations off the main queue. These look relatively harmless, but if we examine them a bit more closely, they are actually computed vars that perform some expensive operations, like creating and using DateFormatter objects, and even doing Natural Language processing using the NaturalLanguage Framework! While using computed vars is "Swifty", they can sometimes hide costly work behind seemingly harmless interfaces. This is especially important to consider in larger projects, or when building out frameworks. So, what can we do about it? Instead of using computed vars to calculate these expensive values at call-time, why don't we manually compute them ahead of time, so that they are already available whenever we work with an Article? This method is invoked once for each Article on a background queue, when the models are parsed. Much better than before, where we were performing this logic on the main queue for every cell dequeue. Front-loading all of these heavy operations should help a lot with our scrolling time. Wow! Those optimizations took us from an average duration of 6.8ms down to just 950 microseconds 👏. And, none of our cells took more than 2.9 ms. That's a huge improvement! These performance enhancements will have a big impact on our users' experience. However, we can take things even one step further. // We have to make this table view and register a cell, otherwise our cellForRowAt function will crash! 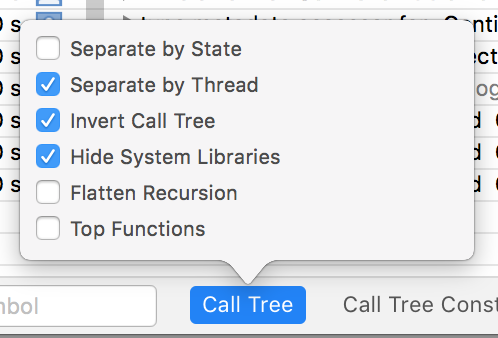 If we run this test, Xcode will average the performance of our cellForRow method over 10 invocations (configurable), then give us the opportunity to set that average as the new baseline. 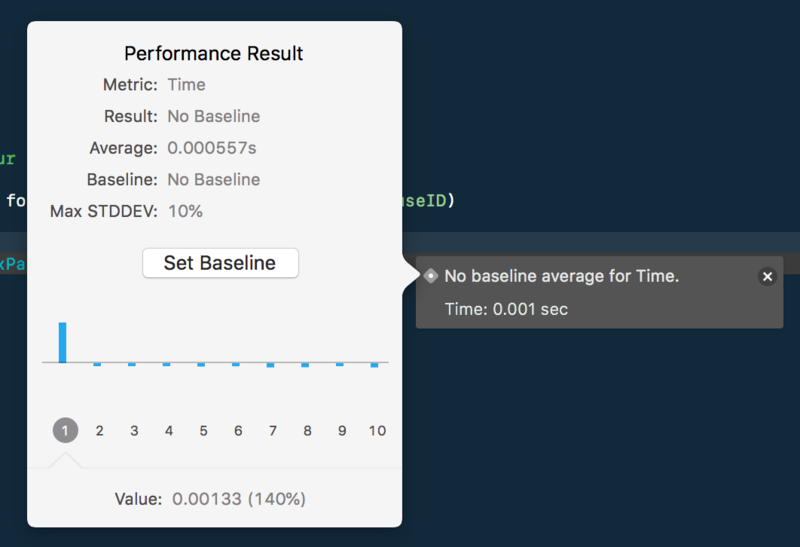 Click Set Baseline to have this test fail in the future if the performance exceeds 10% of the measured value on a comparable device. 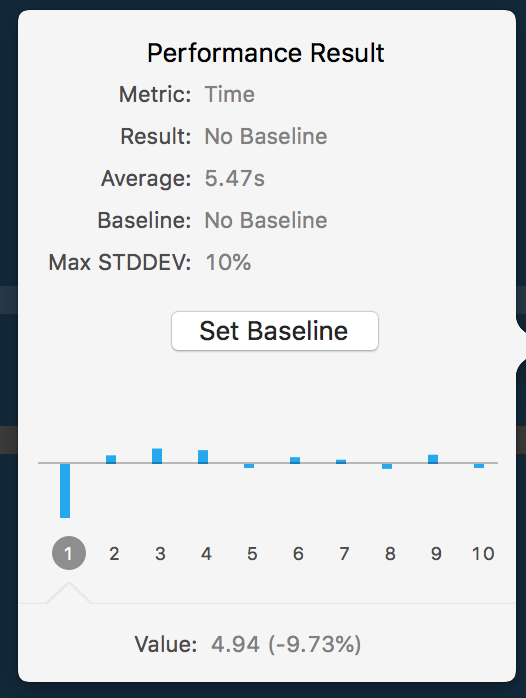 Xcode stores this data in .xcbaseline files under xcshareddata/xcbaselines, and knows how to adjust this value based on the current target device to prevent unexpected test failures. Now, we can ensure that our scrolling performance doesn't degrade without our unit tests failing. Another issue we're seeing is that the app feels a bit slow to launch. This is only happening when the app has been used previously on the device, not on a fresh install, so we know it is probably cache related. In Apple's WWDC 2018 Session #407 (Practical Approaches to Great App Performance), they note that it takes between 500 and 600 milliseconds to complete the zoom animation when launching an app from the home screen. The dyld dynamic linker takes up at least 100ms of that, which leaves less than 500ms for our application to prepare itself and return from didFinishLaunching. That's just for our app to become responsive. To serve our users best, we must also factor in how long it takes for our app to become usable, with content visible and ready for interaction. 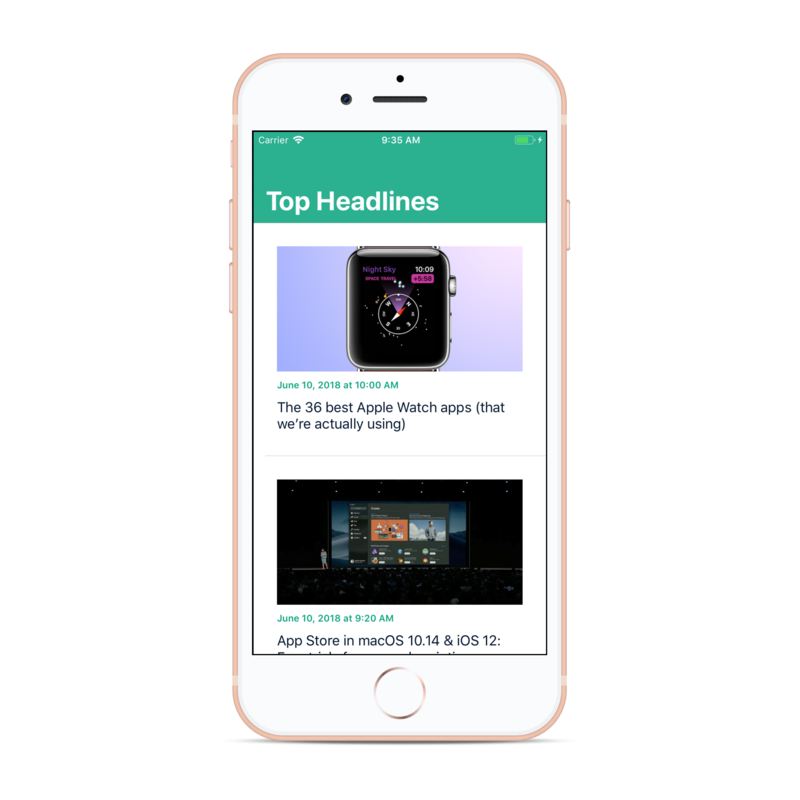 Our News app launch process involves loading cached data from the disk, rendering the initial table view, and fetching new articles from the API asynchronously. At first glance, this all seems valid. But let's use our performance techniques to see what's going on! Let's start, again, by applying some signposts to get a better idea of how our app launch plays out over time. Instead of using a custom OSLog category this time, we're going to use a special category called OSLog.Category.pointsOfInterest. Any signposts fed into this log category will display in the Time Profiler instrument automatically. We'll also add equivalent signposts in didFinishLaunching, and our root view controller's viewDidLoad, viewWillAppear and viewDidAppear, each with a unique name. Lastly, we'll place one in our willDisplayCell method (only for the first row) so we know exactly when the first cell becomes visible. Once we hit this last signpost, we know our app is not just responsive, but usable. Next, let's go to Product -> Profile from Xcode and launch the Time Profiler instrument. I have labeled each point to demonstrate the overall timeline of app launch. We can do better! Let's figure out what is taking so long. The Time Profiler is a powerful instrument. It pauses the application's execution every millisecond, and captures all backtraces from all running threads. As you can imagine, that generates a ton of data. Let's review some approaches to effectively filter that data to what you actually care about. Now we'll expand the Main Thread. In many cases this yields a decent list of non-system methods that the CPU is spending a lot of time on. Luckily our earlier cell configuration changes should already resolve the Article formatting bottleneck once they are merged in. But what about the DiskCache? Let's dive deeper to see what's happening. Double-clicking this symbol will symbolicate the backtrace from the associated build (as long as the build products still exist in DerivedData) and highlight our actual code with weights. The 17x to the right indicates that our DiskCache.loadAll method was utilizing CPU in 17 samples. The Annotations pane on the far right lets us know that this method is using up 25% of the total CPU time for didFinishLaunching. 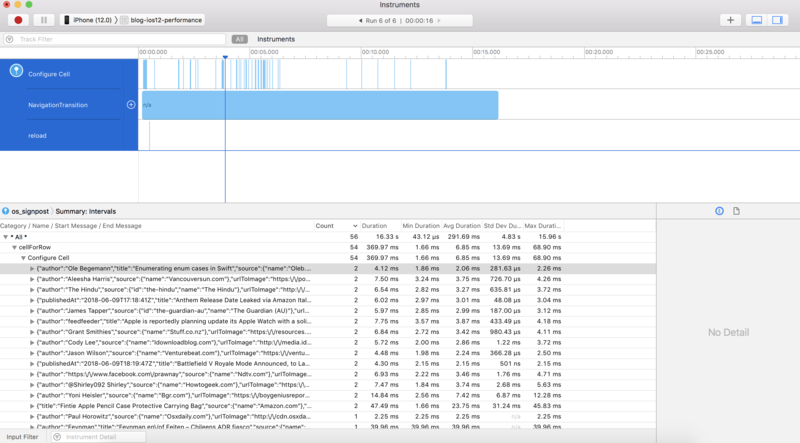 Now it's clear that loading all of the cached articles is a big contributor to our slow app launch performance. While diving into the backtrace data, you may see a lot of system calls that you don't really care about. Instruments gives us the ability to charge these lesser-valued invocations to their callers. This is essentially telling Instruments that we don't care about this particular method, and any usage it incurred should be counted in the calling method. To do this, right-click and choose "Charge X to callers". This is a great way to get a cleaner view in the Time Profiler. Now that we have a good idea of where our app launch process is bogging down, we can apply some optimizations based on our knowledge of the common bottlenecks we discussed earlier. We'll cache our articles on the disk in a single .json file instead of a separate file for each article, reducing I/O from involving hundreds of files to a single file. We'll make sure we're only loading our cached articles once -- our ArticleListViewController doesn't really need to be initialized with pre-loaded [Articles]. We'll load from the cache asynchronously on a DispatchQueue instead of on the main queue, to allow the app to become responsive more quickly. We also found that, hidden away in our ImageLoader.init, we were loading our cached images into memory during app launch. This wasn't immediately obvious looking at the code, since it was a simple property on our view controller. It doesn't add any value to have these images in-memory immediately. Instead, we'll only load images into memory when they're asked for. We also found a simple business logic change that has nothing to do with code performance! Instead of loading 100 articles from the API on each request, we'll reduce our page size to 40. Combined with pagination, this is a smarter use of the API. See the sample code for more detailed information about the optimizations applied. As you can see, we've reduced our app launch CPU usage to around 311ms, about a 60% improvement! The signposts fire so quickly that the time profiler groups the viewWillAppear and viewDidAppear into a single icon. Note that these values are higher than our tightly refined sample from the code. This is due to overhead from dyld, the debugger, and XCUIApplication. Don't worry about the actual number here, all that matters is that we have a baseline. Now that we have a baseline test, our CI/CD routines will automatically alert us if our app launch speed has dropped more than 10%! All tests performed on an iPhone X running iOS 12 Beta 1, with equivalent data and cache usage. os_signpost is buggy on the iOS Simulator in Xcode 10 Beta 1. Always measure original performance before optimizing code, otherwise the impact of the optimization cannot be accurately weighed. Premature optimization is a thing! A mature suite of unit tests is the best way to ensure code optimizations do not introduce defects. Always consider whether requirements and/or UX changes can help solve performance challenges. See the sample code for a more detailed look into the before/after of our News app. In summary, it's time to follow Apple's lead with iOS 12 and build app performance optimization into our regular workflow as developers. 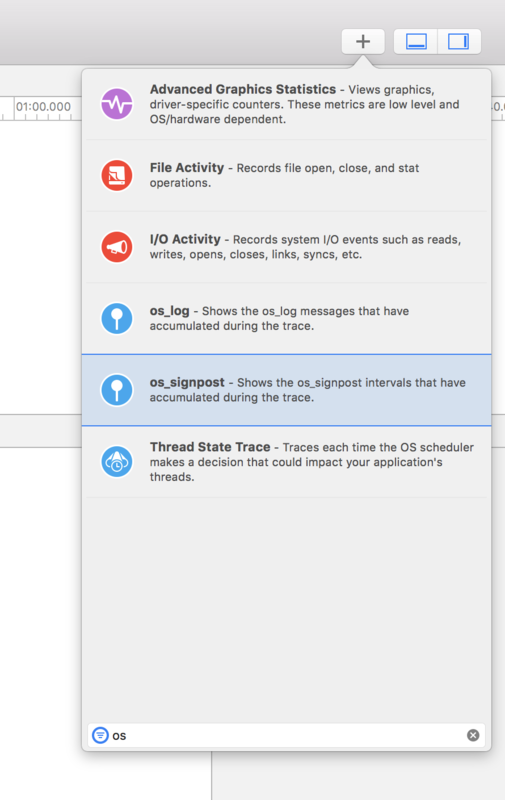 With os_signpost, Xcode Instruments, and XCTest, finding and fixing performance issues is easier than ever. Swain Molster is a mobile developer for CapTech based out of the Reston, VA office. Currently specializing in iOS, he is passionate about mobile architecture, Swifty programming, and using new technologies to help make people’s lives easier.